Olivier Blanchard » On Writing » ‘The Nemesis Engines’ series doesn’t just pay homage to war veterans, it helps them. World War 1 officially ended in Compiègne, France, on November 11, 1918. In just four short years, ‘the war to end all wars’ had claimed roughly 17 million lives and left over 20 million additional men, women and children wounded. Almost 100 years later, November 11th is still, in many parts of the world, a date of remembrance and reflection, and for good reason. The Nemesis Engines series, which takes place during the first world war, wants to help celebrate Armistice Day in the most useful way it can: by helping war veterans pay their bills. 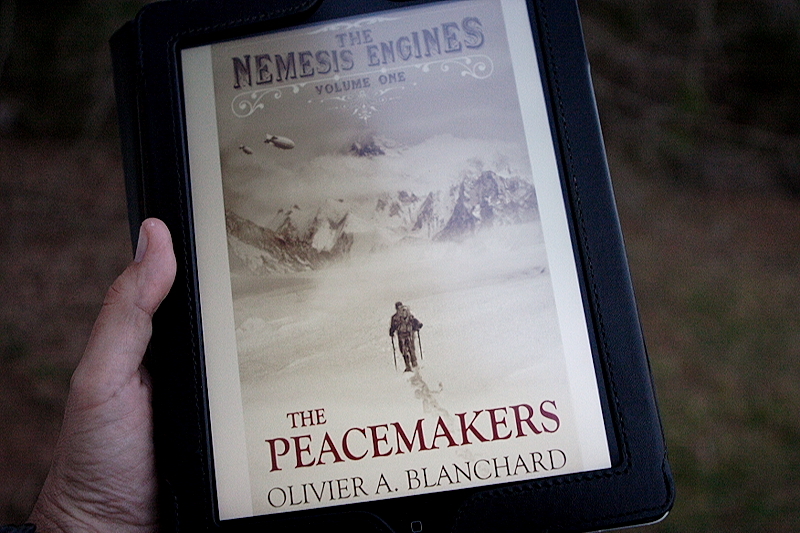 Starting now and through November 11th, all royalties from The Nemesis Engines – Vol.1: The Peacemakers will be donated to a not-for-profit organization that support veterans. (Rather than choosing the organization myself, I will let you, my dear readers, suggest one to me.) This isn’t the first time that I have used The Nemesis Engines to help veterans and it certainly won’t be the last, so expect more things like this from me as the next two volumes of the series are released. I hope you will help me make a difference in some veterans’ lives, starting right now. We’ll start small and see where things go. If you haven’t purchased or read The Peacemakers, this is your chance to finally discover it. And if you have already dipped a toe in my little world of Verne-style adventure and revenge, this is your chance to help some of your favorite reader friends discover something special, especially if they will enjoy a mix of dark retro style science-fiction and gritty WW1 era action. Thanks in advance for your help, and don’t forget to let me know what veteran-friendly organizations I should put at the top of my list. Note: If you have been nervously waiting for Volumes 2 and 3 to come out, you won’t have to wait too much longer: the release schedule for Vol.2 is still Q1 2015 (probably March), and Q1 2016 for Vol.3 (the conclusion).